There were five AAU National Championship records broken on day six of the AAU Junior Olympic Games. You can check out the full list of records here, but below are some of the biggest highlights from the third day of competition in Ypsilanti, Michigan. The guys of Ultimate Speed Academy set a new AAU Junior Olympic Games National record in the 15-16-year-old 4x400m prelims. The old record was 3:14.84, set in 2007 by Titans Track Club. The guys from Ultimate Speed Academy took a whole two seconds off that time running 3:12.18. Watch the race below and see their interview here. Also get ready to watch them race again Saturday in the finals where they could lower their time even more. Reese Vannerson won the distance triple crown in the 12-year-old division, finishing off the sweep by winning the 1500m (4:34.20) Thursday. Earlier this week he won the 800m running 2:11.29, and the 3000m running 9:58.69. Vannerson was the only 12-year-old boy to run under ten minutes in the 3000m. Akala Garrett was the 11-year-old 80mH champion at the 2016 AAU Junior Olympic Games (12.95). This year in 2017 she came back and proved herself again, winning the 12-year-old 80mH title. She's also showing hurdling runs in the family as her dad was a 400mH and her mom is her coach. Sydney Juszczyk from Ultimate Speed Academy in St. Louis has only been throwing the javelin for a year, but she's already become a national record holder in the 14-year-old age group. She threw 141 feet, 0 inches to take home the win and the national record. 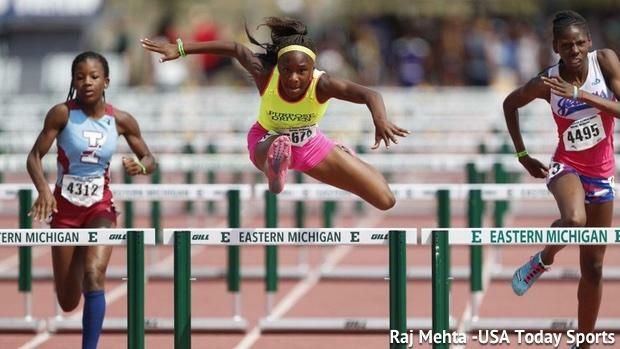 She will also be competing in the triple jump and 100mH at the AAU Junior Olympic Games. Akala Garrett of Purpose Driven NC Elite floats over the hurdles on her way to her second AAU Junior Olympic Games 80mH title in a row. Cha'iel Johnson (@BabyChaiel_85) has JETS https://t.co/8UxclhlJzP.